Tiny, stylish, powerful. If you are keen to find a coffee maker quite a compact for your small household than Dolce Gusto Mini Me should become your choice. This machine will make your day if you know what real coffee beverage tastes like. So, while looking for a small but perfect cup of your morning coffee, take a look on the Nescafe Dolce Gusto Mini Me ― this is a small but very notable thing. Well, let us find out why. 1.1 Dolce Gusto Mini Me ― what’s aboard? Dolce Gusto is a unique coffee brewing system that is based on the capsule or so-called single-serve technology (read more of single-serve system). It means that you insert the pod with your beverage in a separate slot, you push the start-button and a minute later you enjoy your favorite drink. Brilliant and simple, isn’t it? Dolce Gusto Mini Me ― what’s aboard? Before telling anything, let’s mention that Mini Me is not a high classified coffee machine for coffee houses. It is a small device for home use for those who appreciates the taste of real, hot, intense espresso and other coffee beverages. Dolce Gusto Mini Me is the smallest coffee machine in its class and in the whole Delonghi Dolce Gusto series. It will not take too much space in your kitchen, and will perfectly fit every shell on which will be put. You won’t find single-serve coffee maker smaller than Mini Me. You won’t find coffee machine more functional with such dimensions. That’s why ― size is its absolute pro. Dolce Gusto is the fully automatic system of coffee brewing. You only have to fill the water tank, put your coffee pod in the bin and push the button. Mini Me will do the rest and brew you an excellent beverage. The only disadvantage of such an automatic technology is its narrowness: you can not choose the intensity, volume, richness of your drink. But every capsule has its own content that will allow you to brew coffee you want. You know the pressure that´s needed to brew real barista-style espresso. It’s 15 bars. What does it mean? It means that Delonghi Dolce Gusto Mini Me can produce such power, and it means that you can enjoy the real espresso with this coffee maker. Such a power, as well as its small dimensions, can be considered as an absolute pro of this coffee maker. Delonghi Dolce Gusto coffee machines have a specific but still very stylish, avant-garde outward. Mini Me is like a small astronaut in his suit. It has not angled at all. The softness of each detail is stunning and very peculiar. If you decide to purchase exactly this coffee maker then you can be sure ― it won’t spoil the interior of your household. 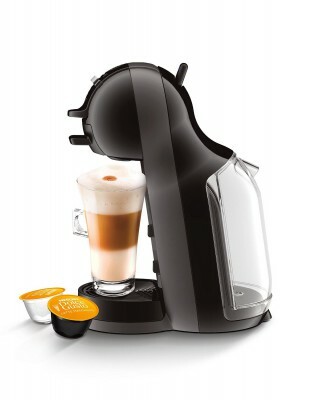 Delonghi Nescafe Dolce Gusto Mini Me is an outstanding coffee machine on the market. We have overlooked the most notable features of this single-serve system. Now let’s look closer over its advantages and disadvantages for being purchased. Dolce Gusto Mini Me can be regarded as one of the cheapest pod coffee machines. The count begins from $119. Just imagine ― $119 for everyday barista style morning coffee. It’s worth it. automatic system for the brewing. It’s all about your time. You don’t need to be a professional barista to brew real espresso, cappuccino or any other type of beverage. It’s 45 seconds, and you have perfect coffee in your cup. Automatically, just by pushing the start-button. Large coffee machines are regarded as the symbol of power and real coffee. But they won’t fit in the short of space room. Dolce Gusto Mini Me will be more useful there cause it’s small and almost noiseless. Single-serve coffee brewing system has one peculiar advantage for every coffee lover: it is the great variety of beverages you can make with just one coffee machine. There are almost 20 tastes performed in the market. You have only to choose pod you like and insert it in the special slot of the machine. To brew coffee you like you have to purchase special capsules or pods with the taste your prefer. Pods usually are sold in boxes of 16 capsules. One capsule is one cup. If it is traditional black coffee, it’s 16 cups of beverage. But when you purchase cappuccino box, you get only 8 cups of the drink (8 capsules of coffee and 8 of milk). Well, you can count easily. It is one of the great disadvantages of the whole single-serve system of coffee brewing. Every milk beverage is made of powder milk and it reflects in the taste of the drink. So, if you are keen to find a coffee maker for brewing the milk types of the drink, you’d better look over Mr.Coffee Cafe Barista Premium Espresso/Cappuccino System. The body of the Mini Me is made of very cheap flimsy plastic. It is possible not notice it because the machine has a really great design, but in time while using it, some parts will become noisy. Delonghi Nescafe Dolce Gusto Mini Me is a rather interesting choice for a small household of the single person. It’s absolutely useless for large families because one cup of the drink will become too expensive.